B.R. 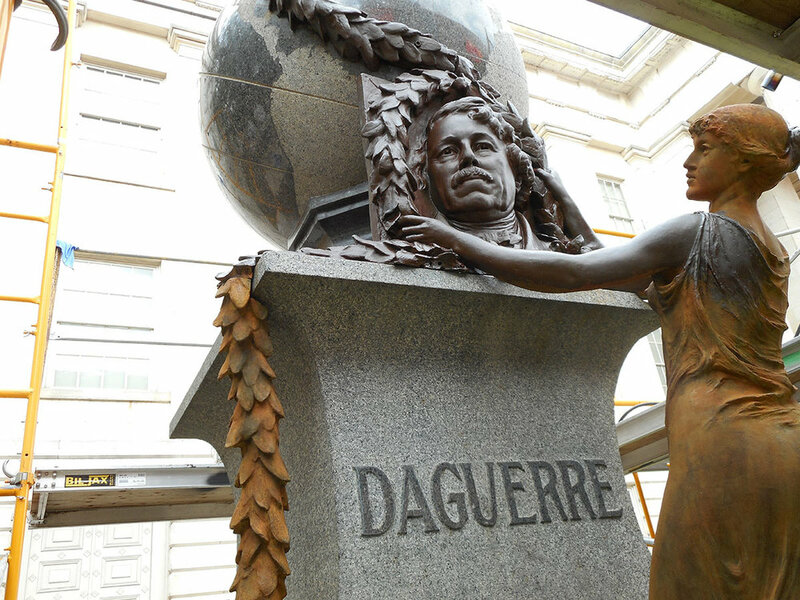 Howard was contracted by the Smithsonian to conserve their Daguerre Monument that sits outside of the National Portrait Gallery. Louis-Jacques-Mandé Daguerre (November 18, 1787 – July 10, 1851) was a French artist and chemist, recognized for his invention of the daguerreotype process of photography. The bronze figure had been exposed to years of the outdoor elements which altered the original dark brown appearance. Air pollutants, and algae had accumulated on the surface or the granite globe. There were also old repairs on the damaged portion of the pedestal which were unsightly and visually distracting. BRH erected scaffolding around the monument and pressure washed and cleaned all the surfaces. The bronze was re-patinated to its original brown appearance and hot waxed using a specially formulated blend of waxes. It was then cold waxed twice and buffed between the coatings to ensure all areas were covered. A bronze insert was created to cover a missing fastener mount in the foot of the figure. The granite was cleaned and polished. Excess caulking was removed from the surface. The old repairs to the damaged granite were toned to match the adjacent surfaces for better visual integration. BRH now performs annual maintenance to the monument for the Smithsonian.